In contrast to land, where coverage of the soil surface by vegetation often is near 100%, only a small percentage of the streambed supports growth of higher plants. As Hynes (1970) points out, aquatic botanists have an understandable bias toward studying areas where plants are fairly abundant. Even so, studies of macrophyte production in two midsized Appalachian rivers estimated cover between 27% and 42% (Hill and Webster 1983, Rodgers et al. 1983), and in Bavarian streams 37% of the area studied was found to have <10% cover (Gessner 1955). In a small Danish lowland stream, the combined area of C. cophocarpa patches covered up to 70% of the streambed. The remaining area apparently was unsuitable habitat due to a strong shear effect and coarse substrate that limited the growth of the plant (Sand-Jensen et al. 1999). Clearly, the amount of macrophyte cover varies enormously with locale, and in many stream habitats macro-phytes are of little importance. Where macrophytes do occur, the growing season can be quite long if water temperatures stay above freezing throughout winter. In British rivers, many species simply grow slowly or cease growth during winter, although others, emergent plants in particular, shed leaves and die back to rhizomes and stolons (Hynes 1970). In tropical waters there likely is little seasonality to growth, unless due to changes in river flow. Hardness of water, or its correlates including calcium, alkalinity, and pH, influences the distribution of particular macrophyte species and also limits the occurrence of bryophytes, probably by affecting the availability of free CO2. Indeed, the flora of British rivers can be reasonably categorized on the basis of hardness, current, and substrate with the result that certain taxa are regularly associated with particular environmental conditions (Hynes 1970). Current and high-flow events strongly influence the presence of macrophytes. Riis and Biggs (2001) reported a negative correlation between macrophyte abundance and frequency of flood disturbance in unshaded streams of New Zealand. Similarly, the biomass of Najas in a fluvial pool of an intermittent stream in Brazil declined after floods, and larger floods resulted in longer periods before recovery of lost biomass took place. Where floods are frequent, common species may produce many propagules, an adaptation for recolonization (Maltchik and Pedro 2001). Along with current, light is one of the most important factors limiting macrophytes. Heavy shade results in complete exclusion of angios-perms, prompting Bunn et al. (1998) to attempt to use shading as a control of an invasive aquatic macrophyte in Northern Australia. 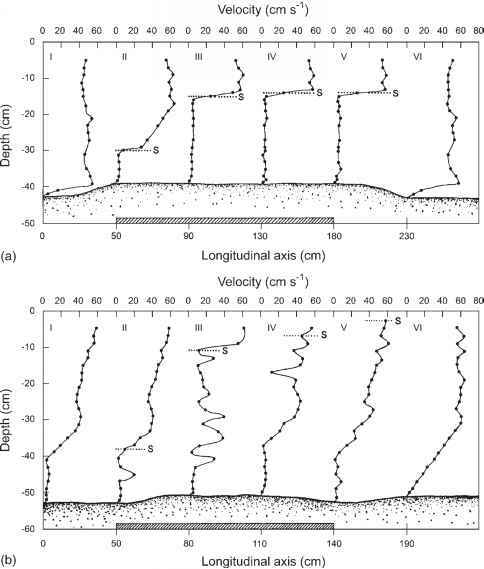 When light levels in the stream channel were reduced by 50% and 90% using shade cloth, plant biomass decreased significantly. The largest effect was observed under 90% shading, which reduced plant biomass by half. Light also attenuates with depth, which inhibits the establishment of macrophytes in deeper rivers, although the precise depth at which photosynthesis can no longer balance respiration varies with turbidity and species-specific light requirements. Some very turbid tropical rivers lack higher plants for this reason. Major plant nutrients, particularly P but possibly N and potassium, can be limiting in nutrient-poor waters such as mountain streams. Lowland rivers, which often provide the most suitable flow and habitat conditions for macrophytes, typically are nutrient enriched due to human activities. Although a positive relationship between nutrients and macrophyte biomass has been shown in some rivers and streams (Chambers et al. 1991, Carr and Chambers 1998), other lotic systems have not shown such relationships (Peltier and Welch 1969, KernHansen and Dawson 1978, Canfield and Hoyer 1988). Potential explanations for not observing a strong association between macrophyte growth and nutrients could be related to the influence of other factors including light (Canfield and Hoyer 1988), sediment type and texture (Barko et al. 1991), herbivory (Lodge 1991), or current velocity (Chambers et al. 1991), which could confound the association with nutrients. The relationship between nutrients and macrophytes is also influenced by macrophyte growth form because the latter determines the primary nutrient sources for the plants. In the case of rooted macrophytes, sediment N and P may be a better predictor of growth than water nutrient concentration because these plants acquire nutrients primarily from the sediments (Barko et al. 1991, Rattray et al. 1991, Carr and Chambers 1998). Herbivory on freshwater macrophytes generally has been viewed as unimportant in limiting their growth and abundance (Hutchinson 1981). 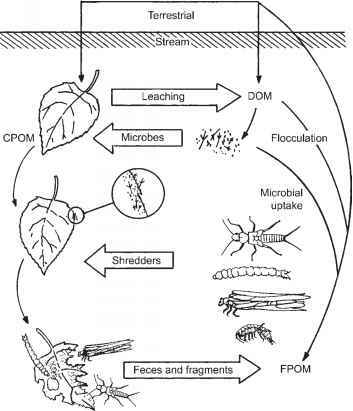 However, Nystrom and Strand (1996) showed that crayfish can have a strong negative impact on macrophyte biomass. Terrestrial herbivores feed on emergent vegetation, some river-dwelling vertebrates including waterfowl, manatees, and grass carp (see Chapter 9) consume submerged aquatic macrophytes, and others such as muskrats harvest plant material for construction of lodges (Westlake 1975b). However, few representatives of the major groups of aquatic invertebrates are able to graze on macrophytes until after death and decomposition of the plant. Interestingly, some insects are effective herbivores, but these are species phylogenetically allied with families and orders of insects that are primarily terrestrial (Newman 1991). Some of these herbivorous insects are successful agents of biological control, as is the manatee, against waterweeds that in many areas pose a serious nuisance.